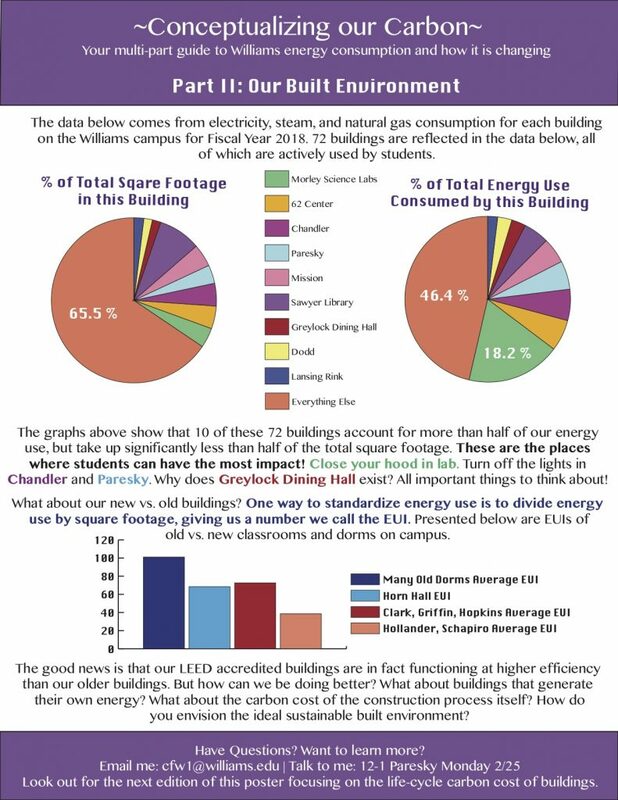 As an Eco-Advisor, for the past several months, I have been crafting and implementing a poster campaign in bathroom stalls to increase the average IQ of the student body at Williams related to sustainability issues, particularly as they pertain to energy and emissions. The posters have examined where our energy comes from, how much we use, where we use it, how our buildings are performing, and the carbon cost of the materials that go into our built environment. At the end of each poster, I ask readers to bring the information they just learned into larger questions about sustainability in our community. As an update, I offer my response to one of the questions I have posed. 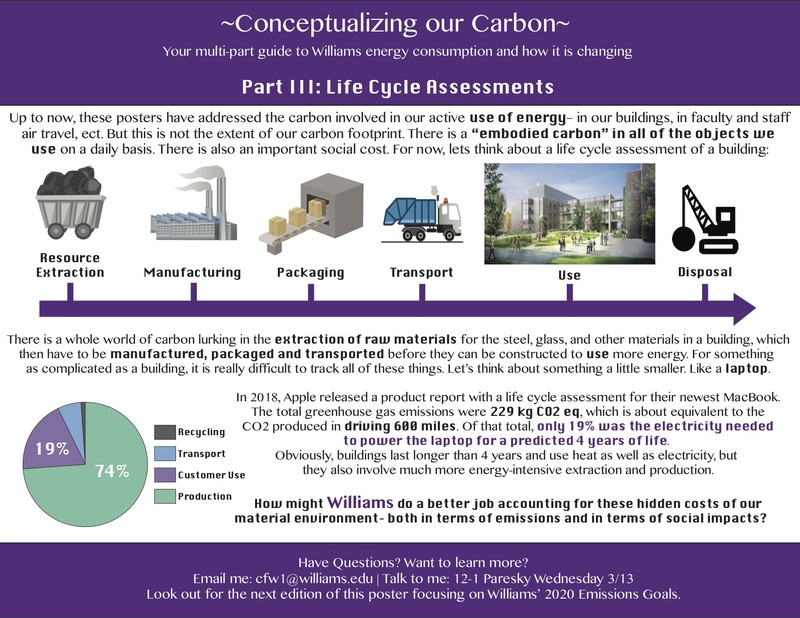 In the most recent poster – “Part III: Life Cycle Assessments”– I posed this: “How might Williams do a better job accounting for the hidden costs of our material environment– both in terms of emissions and in terms of social impacts?” Thinking about our carbon footprint in a holistic way is a crucial step in being a sustainability leader as an institution. What might this look like? It means a life cycle carbon assessment for each new construction project, with as much attention to detail in each step of material production and transportation as possible. When a dorm needs renovating or when we want to provide new equipment for a lab, we must consider every step of production of every material that we use in constructing that space. This helps us evaluate the worth of those spaces in a more intimate way, and aims to represent what really goes into each material and process our buildings depend on. This holistic assessment is not something that most institutions or corporations do (or even consider), and it is our duty as an institution who claims to prioritize sustainability to make this effort. We must also consider social sustainability in our material investments. So many different humans interact with the material goods (building materials, food, natural gas, electricity, etc.) we use as a College on a daily basis. We must be working to ensure that those involved in every step of production and transportation of the materials we consume are being treated justly. This commitment to sustainability is not easy and it is not flashy, but it must be a part of our work as a College to reach our sustainability goals. Still, these are only a few considerations of many that will be important to address this large question. To fully understand our impact as a College environmentally and socially is not an easy task, but my hope is that this poster campaign can incite desire on behalf students to become more involved in these conversations. I think a great first step is learning about the sustainability work that is already happening on campus. 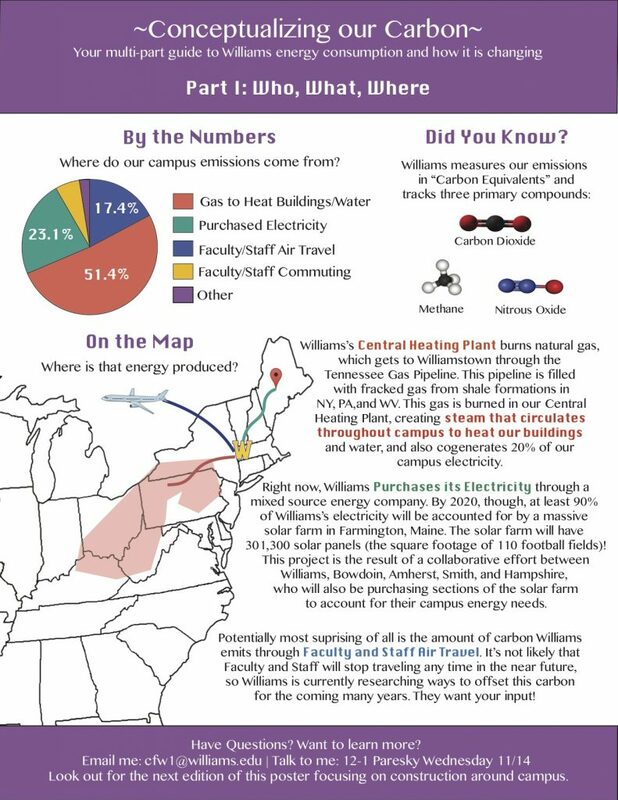 For this reason, part of my project is the creation of a (hopefully annual) Sustainability Exposition in Baxter one day of Earth Week to display, celebrate, and communicate to the student body the work the many Zilkha Center interns have accomplished over the course of the semester. 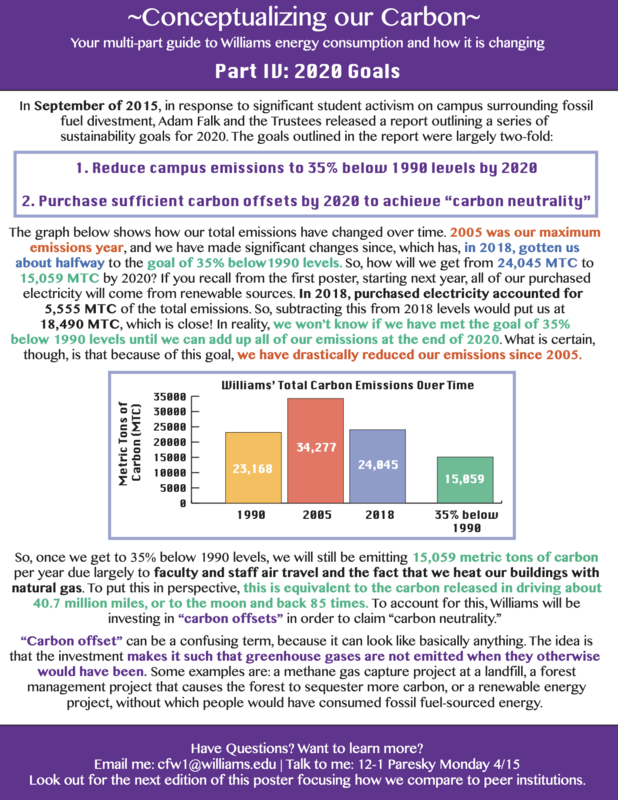 If you have suggestions about the exposition, thoughts about my poster, or questions about our current or future sustainability commitments, I would love to hear from you (cfw1)!